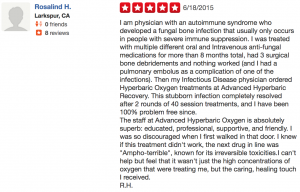 I am physician with an autoimmune syndrome who developed a fungal bone infection that usually only occurs in people with severe immune suppression. I was treated with multiple different oral and Intravenous anti-fungal medications for more than 8 months total, had 3 surgical bone debridements and nothing worked (and I had a pulmonary embolus as a complication of one of the infections). 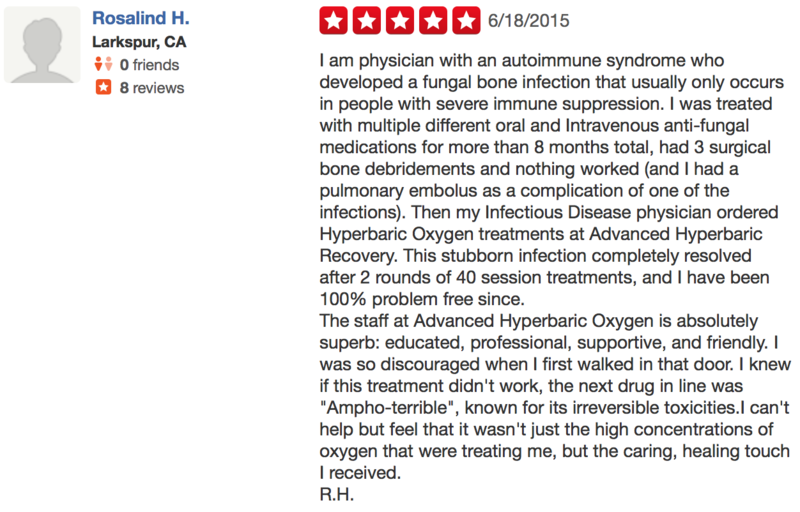 Then my Infectious Disease physician ordered Hyperbaric Oxygen treatments at Advanced Hyperbaric Recovery. This stubborn infection completely resolved after 2 rounds of 40 session treatments, and I have been 100% problem free since. The staff at Advanced Hyperbaric Oxygen is absolutely superb: educated, professional, supportive, and friendly. I was so discouraged when I first walked in that door. I knew if this treatment didn’t work, the next drug in line was “Ampho-terrible”, known for its irreversible toxicities.I can’t help but feel that it wasn’t just the high concentrations of oxygen that were treating me, but the caring, healing touch I received.